About Us | GlyTech, Inc.
GlyTech, Inc. is focused on the application of glycan production and chemical glycosylation technologies to the development of innovative and improved medicines such as biopharmaceuticals and oligonucleotide therapeutics. Biopharmaceuticals and oligonucleotide therapeutics have become indispensable in modern medicine as therapeutics for many chronic and acute diseases that require highly specific treatments. By aiding in the development and improvement of such medicines, we seek to improve the lives of individual patients and benefit society as a whole. From single drug-glycan conjugates to libraries, we offer chemical glycosylation of target compounds with high purity human-type glycans to enhance their drug properties. We work with research and development partners to screen for optimized glycosylation patterns and develop new drug candidates. We supply the biopharmaceutical industry and life science community with highly pure, homogenous human-type N-glycans from research to production scale. Otsuka Chemical Co. initiates a collaboration on N-glycan production with Prof Kajihara of Osaka University. Otsuka Chemical Co. receives a research grant from the Japan Science and Technology Agency (JST) for the development of mass-production technologies for human type N-glycans. Otsuka Chemical Co. begins test production of N-glycans at its pilot-plant in Tokushima. 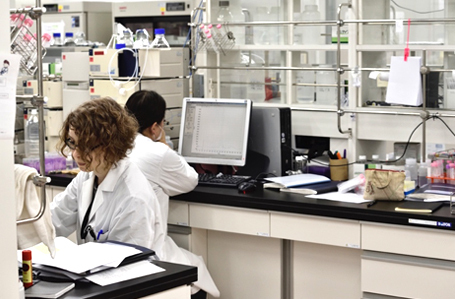 Otsuka Chemical Co. launches a glycotechnology laboratory. Otsuka Chemical Co. enters into a collaboration with American Peptide Company (now part of Bachem Holding AG) on commercial-scale glycopeptide manufacturing. Otsuka Chemical Co. enters into a collaboration with Bachem Holding AG for the development of glycoprotein synthesis technologies. First chemical synthesis of human interferon beta (hIFNβ) is reported in the Journal of the American Chemical Society. GlyTech, Inc. is founded as a subsidiary of Otsuka Chemical Co..
GlyTech, Inc. becomes an independent company. GlyTech, Inc. raises 600 million JPY in capital from the The University of Tokyo Edge Capital Co. (UTEC), DBJ Capital Co., Mitsui Sumitomo Insurance Venture Capital and Mitsubishi UFJ Capital Co..
GlyTech, Inc. signs capital and business alliance agreement with Nippon Shokubai Co..
GlyTech, Inc. and Dr. Katsunori Tanaka of the RIKEN research institute establish a glycan targeting laboratory. GlyTech, Inc receives an investment of approximately 1 billion JPY from Nippon Shokubai Co., Fushimi Pharmaceutical Co., SBI Investment Co., Osaka University Venture Capital Co. and Miat S.p.A..